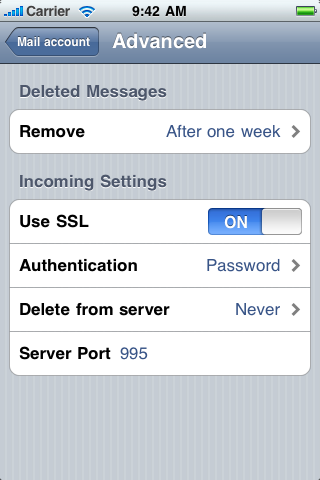 By default, the Mail app on iPhone, iPad, and iPod touch will never delete messages from the server. This setting is appropriate for most users, but can be changed when necessary. 1. In Settings, select Mail, Contacts, Calendars. 2. Select the account for which you wish to change the settings. 3. Select Advanced, located at the bottom of the list. 4. Select the Delete from server option. 5. Choose Seven days from the pop-up menu. 6. Press the Home button to return to the Home screen.